Moses and the Israelites, by Domenico Di Cerchia Piola, Il Vecchio (1627-1703). Oil on canvas, 216cm by 269cm. In a carved and gilded frame. 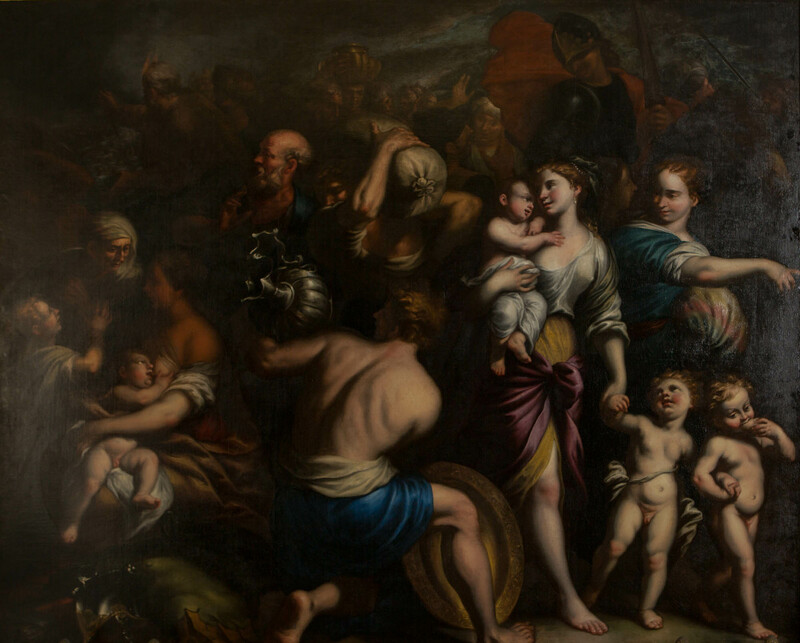 The painting was purchased by John, 5th Earl of Exeter (1648-1700), whilst in Italy on the Grand Tour. It first appears in a Burghley Inventory in 1738: “The Red Velvet Dining Room the Children of Israel come over the Red Sea, a Man kneeling upon one Knee taking up an Ewer with his Back towards you, a Woman with a Child upon her Knee, Men and Women loaded with Sacks and other things, a Man on Horsback in Armour, at a Distance Moses and his Rod, Pharoah and his Host drowning in the Red sea, by Ferrarese”. The 1763 Inventory rather less wordily records: “The dining room..the passage of the children of Israel over the Red Sea by Ferrarese”.